"TRIMARCHIS" CUSTOM LEADED GLASS BEVELED VERTICAL SIDELIGHT WINDOW CREATED BY JACK McCOY© IN ASSOCIATION WITH GLASS BY DESIGN. This leaded glass beveled sidelight window was 6" x 30". 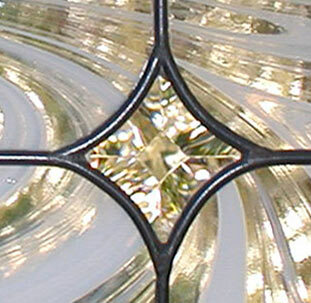 Three star bevels in a background of clear Baroque streaked with white made up this leaded glass sidelight window. This design is very flexible and can be adapted to most any size.